Oikyotaan, fronted by Bonnie Chakraborty, is a performing group that has developed a sound rooted in the rhythm and melody of folk music. This foundation is created using equally unique components from folk and contemporary music and attaching them in an interesting set of arrangements centered around Fakiri, Bhatiyalli, Jhumur and Bhavaiyya Bengali folk melodies. The sound concentrates on building lyrical phrases within a layered rhythm of folk and classical instruments. Oikyotaan aims at reaching a space where folk and contemporary music complement each other without displacing the essential sound elements and aesthetics of the other. 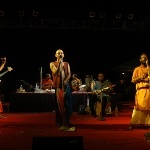 The group comprises of musicians based in Chennai from various musical and cultural backgrounds. Since it's formation over five years ago, Oikyotaan has enthralled audiences with their dynamic live performances at festivals and concerts in India and abroad. A music producer for the advertising and corporate Film World of Chennai, Bonnie is the founder member and has conceived the idea of Oikyotaan. As a sessions musicians for the Indian film industry he has worked with the likes of A.R. Rahman and others. 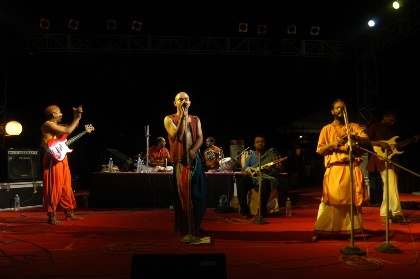 Having spent nine years in the mainstream music industry of Kolkata and performing with various outfits, Bonnie moved to Chennai, where he realized his dream of forming an indigenous platform to support Baul and other Indian Folk traditions, by collaborating with musicians who shared the same vision. Kartick was also an integral part of the presentation of Dehotawtto and Fakiri songs at the World Sacred Music Festival in Berlin in December ,2003. The Oikyotaan research platform is working towards organizing a grant to establish an Ashram for Kartick , which will serve as a database and networking centre for Baul music and its philosophy. One of the leading music producers of Chennai, Paul has produced, promoted and collaborated with many international artistes .His organization Bodhi Music is a platform that supports independent music .Together Bonnie and Paul are the executive producers of Oikyotaan. Donan comes from the jazz rock school of guitar playing and has performed with many of the pioneering bands of Chennai. He has also successfully scored music for the Chennai theater scene, recreating musicals like 'Jesus Christ Superstar' and 'Joseph and the Technicoloured Dreamcoat'. A session musicians and a producer, he is presently exploring the different genres of folk music from south India. 'Tabla Balu' as he is popularly known in the South Indian film industry, is a leading sessions percussionist. He has worked with Illayaraja and other stalwarts of the film industry, Balu has performed with award winning line ups since 1989, Swaralayamela with Vikku Vinayakram, Pulse, Funki Bodhi and Brahma. Saravanan is a versatile Thavil player with years of experience playing in the temples of Chennai and Chidambaram. He is also the visiting faculty at the Chidambaran University as a Thavil lecturer and has traveled to Europe and America, conducting workshops on Carnatic music at various universities.